We don’t make Add-a-Subwoofer packages for Stereo or HiFi systems – if you have one of those systems, you have other opportunities for improvement we recommend before adding a sub. IMPORTANT – Before selecting a subwoofer package, you MUST determine the stock amp-and-speaker audio system in your BMW here. Well, our cars have 8″ midbass under the seat. For good, musical sound, we only need one subwoofer. One subwoofer lets us corner-load, which gets us extra output. But I want lots of bass! Then we may not be the solution. We can provide lots of bass, but our target is something more difficult to achieve – accurate, articulate, detailed sub-bass that integrates with the mid-bass from the underseat woofers. Why do you have a 10″ woofer with the E90 sedan and the E82 coupe, but a 12″ woofer for the E92 coupe? Well, the E90 sedan was first. 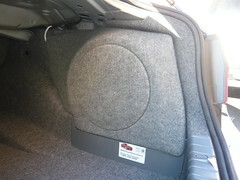 We knew that we wouldn’t take away any cargo-floor area, nor would we block any of the trunk opening. With those parameters, the amount of volume available atop the battery cover is limited. We modeled it up and determined that we could use certain small-volume-optimized woofers and the results should be good. We tested, and had better results than we hoped for. The E92 was next. We measured, and could not find a way to get an above-the-battery-cover enclosure with as much internal volume in the E92 as we did in the E90. We already felt that enclosures with less internal volume than the E90 would have performance limits. We already had some requests for a 12″ from some customers, so we modeled a 12″ enclosure replacing the battery door, rather than sitting atop it. It turned out that we were able to hit the dead center optimal volume for some very high-performance 12″ drivers. 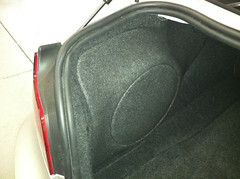 The E82 enclosure was limited by height and by how far we wanted to protrude into the cargo area (as in, not at all). Again, a 10″ driver was optimal for the volume available. Why do you say your subwoofer is corner-loaded? 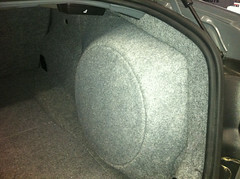 Aren’t all in-car subwoofers corner-loaded due to the cabin gain? Yes, technically, they are – but as someone once said, “All in-car subwoofers are corner-loaded at some frequency, but the frequencies change with speaker position”. The response of this design works very, very well at the frequencies we care about – the sub-bass in the region that the underseat woofers can’t handle on their own.